Yaxley Kites, winners of the Peterborough League's Munday Shield with League president Jean Redhead. (Left to right): John Hadley, Tony Belson, Graham Agger, Joan Robinson, Robert Heath, Les Sharp, Ray Bass, Andrew Cooper. 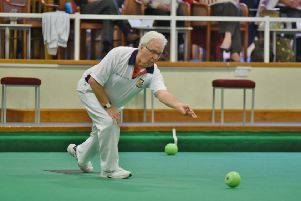 There’s not been a lot for Hunts supporters to get excited about after two weeks of the month-long Bowls England national championships at Leamington. In the six events Hunts were involved in during the second week only the Parkway trio of Emma Thurston, Hannah Overton and Pat Reynolds managed to venture beyond the second round. They recorded wins of 21-8 against Somerset and 20-13 against Berkshire before losing at the last 16 stage 13-18 to Kent. In the same event, Sawtry’s Jan Elliott, Karen Leader and Sandra Minnett went out in the second round 18-20 to Northumberland following a 19-12 first round victory over Wiltshire. In the two-bowl singles, Michelle Barlow (Parkway) was successful in a preliminary round tie, 15-12 against Hampshire’s Allyson Flint, but joined Buckden’s Juliet May at the first round exit door after losing 12-15 to Northants’ Alison Dring, while May was beaten by the same score by Janet Carter (Herts). The pairs representatives both fell at the first hurdle, with Parkway’s Sarah Newson and Catherine Popple, former winners of the national title, losing 16-23 to Oxfordshire, while Houghton and Wyton’s Heather McKillop and Margaret Elstub were beaten 15-22 by Warwickshire. Parkway pair Tony Scarr and Trevor Collins were beaten 21-25 by the eventual runners-up from Dorset in the opening round of the senior pairs. And both the entries in the junior singles, Joe Randall (Parkway) and Ed Elmore (Warboys), perished in the first round – 18-21 to Cumbria’s Callum Hodgson and 11-21 to Bucks’ Michael Gomme respectively. In the women’s junior pairs, Warboys’ Amy Avory and Chloe Brett lost 10-19 to Kent in the first round. Hunts will be hoping for better fortune now the men’s events are under way, the fours being brought to a conclusion yesterday. The triples are under way today with Hunts represented by Warboys’ Harry Ward, Lewis Baker and Nick Brett and Parkway’s Ean Morton, Mike Robertson and Tristan Morton. At the weekend, Parkway’s Nigel Eagle is involved in two competitions, the senior singles and the mixed pairs with Sarah Newson. The pairs takes centre stage at the start of the final week, with the Morton brothers from Parkway, Ean and Tristan, and Warboys’ Tom Swannell and Ed Elmore flying the flag for Hunts. Then it’s the two singles championships with Ed Elmore (Warboys) involved in both the two-bowl and four-bowl disciplines, James Price (Brampton) and Simon Leader (Warboys) are the county’s other singles qualifiers. The English Bowling Federation national championships are under way at Skegness and a full report on how the Northants representatives fared will appear in next week’s Peterborough Telegraph. Althought beaten twice by CoP Molins A in the Peterborough League Premier Division programme this season, Yaxley Kites took the honours when the clubs clashed in the final of the League’s Munday Shield at Whittlesey Town, host club of League president Jean Redhead. Yaxley Kites were comfortable 46-23 winners in the double rink competition with rinks skipped by Graham Agger and Tony Belson inflicting 22-12 and 24-11 defeats on those of Michael Humphries and Malcolm Squires respectively. Les Sharp, Joan Robinson, John Hadley, Graham Agger 22, Alan Griffiths, Tom Polkey, Peter Eddings, Michael Humphries 12. Andrew Cooper, Ray Bass, Robert Heath, Tony Belson 24, Norma Squires, Phil McQuillen, Mick Pegler, Malcolm Squires 11.